This pair of Yellow Patio Standard Roses will produce a summer long display of beautiful fragrant blooms. 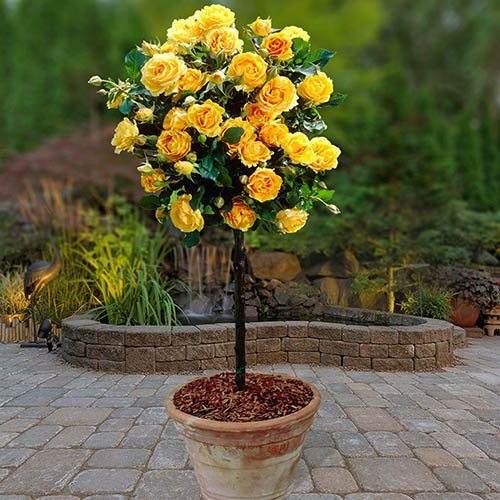 Also known as Tree Roses, they are the perfect way to add height and style to your patio. The flowering variety is ‘top grafted’ on to the straight stem of the rootstock. Perfect for framing patios, pathways, gateways and pathways. Supplied as bare root trees ready to be potted up on receipt. These standard patio roses are AMAZING quality and SUPERB value for money. Less than HALF NORMAL NURSERY PRICES! They will produce a summer-long display of beautifully fragrant blooms for years to come, adding style and height to your patio, decking or balcony. Also known as Tree Roses, a single bush will make a dramatic, stand-alone feature but will also look fabulous as a pair of potted specimens to dress a door or gate. This unique type of rose is only possible because painstaking work has been undertaken by the grower, ‘top grafting’ the flowering variety on to the straight stem of the rootstock, thereby giving the height. It takes 3 years to produce these floral gems – they are supplied as bare root bushes ready to be planted immediately upon receipt, supplied approx 60-70cm tall with bushy heads. Add mycorrhizal fungi to the roots when planting to help the plant establish quicker. Roses can be planted at any time of the year, as long as the soil is not frozen, waterlogged or drought-dry. Plant your rose where it can get plenty of sun for at least half of the day, and where it will be sheltered from the wind. Roses tolerate wide range of soils but thrive in deep, humus-rich, moist but well-drained soil, so add plenty of well-rotted manure into the hole if necessary. Water well every other day - daily if the weather is hot and dry. Established roses can be watered around once a week through spring and summer - more if the weather is hot. For best results, feed roses in in late-March/April and again late July. When pruning, make sure that your secateurs are clean and sharp to prevent squashing stems and introducing disease.